Breeders of pedigree cats are a finicky bunch, and why shouldn’t they be? A flaw passed down from parents to kitten can drop the asking price of a purebred with papers by thousands when a buyer comes knocking. 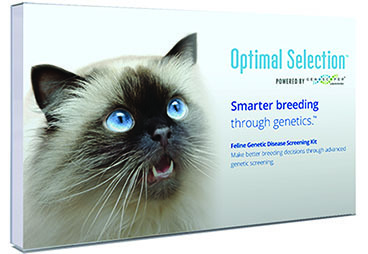 To take the guesswork out of breeding, Mars Veterinary released a new DNA genetic health test for cat breeders under the brand Optimal Selection. The test was developed in partnership with Genoscoper Laboratories, a Helsinki, Finland company known for its DNA testing for pets. Selecting for the best can translate into big bucks for breeders. In an example from a 2016 Huffington Post blog, “Hardly A Purr-Fect Price—5 Most Expensive Cat Breeds in the World,” genetic quality is reflected in the huge price range of $15,000 to $75,000 plus for an Ashera—said to be the world’s most expensive breed, according to the blog. “We are excited to be working with our partners at Genoscoper to bring this first-of-its-kind disease testing panel to cat breeders,” said Cindy Cole, DVM, Ph.D., general manager of Mars Veterinary of Vancouver, Wash. The Optimal Selection test lets breeders screen cats for more than 25 mutations and gives breeders a heads-up as to the individual genetic health of cats being considered for breeding. “This kind of tool enables breeders to work proactively to identify diseases in their litters. Ultimately, it can help them to make informed choices and may reduce the likelihood of producing kittens with preventable genetic conditions,” Dr. Cole explained. The Optimal Selection test runs about $70, and it is available to U.S. cat breeders here.